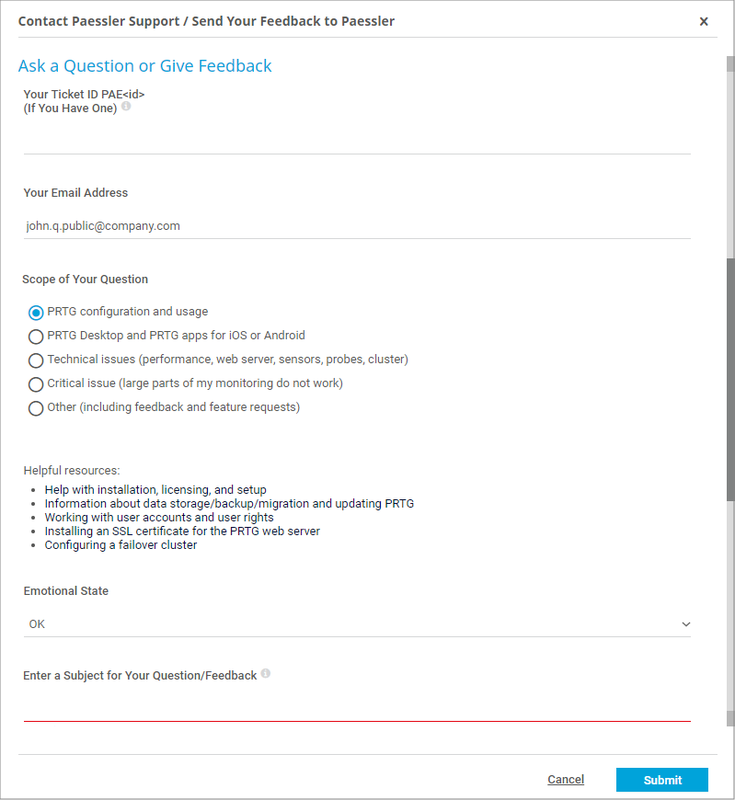 For technical issues, please use the Contact Paessler Support / Send Your Feedback to Paessler form in PRTG. To open the form, select Setup | Contact Support from the main menu. You can also open the form via Contact Support in the footer on every page in PRTG. On the one hand, you can use this form to give us feedback. Help improve PRTG by providing criticism, praise, bug reports, and feature requests. Any comments are welcome! Your feedback will be handled directly by the Paessler Support Team. On the other hand, you can use this form to ask for support regarding technical issues. To make the support contact more comfortable, PRTG can automatically attach a screenshot in combination with a Support Bundle that contains several selected PRTG logfiles and status files. This information really helps our support team to analyze any issues you may have with PRTG. Please also consider the suggested links to articles regarding the scope of your issue. We offer our support directly from our headquarters in Nuremberg, Germany, working closely with our development department to guarantee the fastest and most constructive assistance possible. As we have to analyze a lot of data over the course of a support case, like logfiles and screenshots, we use email as our primary support mechanism. Our office is staffed Monday to Friday from 7 a.m. until 10 p.m. (UTC+1), so you will receive an answer within 24 hours on business days. Depending on the complexity of the case, we may need to ask for remote access to your system, or to schedule a remote desktop session. Customers with valid maintenance can open support tickets. Please use the Contact Support form of your PRTG installation for technical questions to get the best possible help from our experts. If you have trouble using this form, you can fill out the support ticket form on our webpage. Are you looking for updates or your license key? Log in to our service center. Please write us in English or German. Please open a new ticket for each new topic. If you are a user of PRTG or any other of our services and would like to file a security report, please send an email to security@paessler.com. Please always include a detailed technical summary in your email. If you wish to send us an encrypted email, please use the public key on this page https://www.paessler.com/support. Do you need assistance for your network setup or detailed installation planning? Our partners are happy to help. Please contact a partner near you. Do you use our Freeware? We try to answer your questions in a timely manner, but if we are busy, paying customers come first. You may find a prompt answer in our Knowledge Base. You have requests or suggestions that could improve PRTG Network Monitor? Our Support Team is happy to hear your ideas! Read more in our Knowledge Base on how we handle your feedback. Your Ticket ID PAE<id>: If you have already opened a ticket (directly via email to support@paessler.com, via the Knowledge Base, or via the support form on paessler.com), enter its ID here. You can find it in your confirmation email regarding the request we received. You can provide the ID with "PAE" in front or just the number. If you leave this field empty, you will create a new ticket when you submit this form. Your Email Address: Enter your email address here. You can provide any of your addresses; however, the recommended and default address is the email address of your PRTG account to be able to associate you with your license. Scope of Your Question: Select a topic regarding your issue and consider the proposed links. Emotional State: If you want to, you can indicate your current feelings about PRTG. Describe Your Question in One Sentence: Provide short information with max. 60 characters to indicate the topic of your issue. Do You Have Any Further Comments? : Leave your comments here. They can be feedback or support questions. If you have a support question, please describe your issue with as much detail as possible! To provide the most helpful information possible, you can attach a screenshot of the current page and a support bundle with useful analytical data about your PRTG installation. Do not attach screenshot: Send the ticket without a screenshot. We recommend that you attach a screenshot of the affected PRTG webpage so that we can understand your request more easily. Create and attach screenshot (recommended): Create a screenshot of the currently displayed page in PRTG to send it with your ticket. You can see a preview below the screenshot section. If you encounter issues on a specific page in PRTG, open the contact support form on this page to get a screenshot of it. This is not possible on error pages, which are not meaningful enough for our support team to solve your issue. Attach Base Pack with logfiles and PRTG configuration file: Additionally contains the configuration file. Send this package only if our support team told you so! Usernames, encrypted passwords in the config.dat file, and passwords that your browser masks while you enter them on settings pages will be removed before PRTG sends this package to Paessler Support. Do not attach a Support Bundle: The ticket will not contain files. Choose this option only when sending feedback. Click the OK button to send your request directly to our technical support team, or click Cancel to return to the page where you opened the contact form. Usually, you will receive an answer from our support team within one or two business days, no matter whether you provide feedback or you have a question. If you have questions or feedback regarding your license purchase, upgrade, or maintenance extension, please contact our customer service. Knowledge Base: How does Paessler handle user feedback and feature requests?